Once again, we ask for prayers for the situation in DRC. This time, we are not only asking for prayers regarding the heart-crushing adoption situation, but also for the entire conflicted nation. For two days, streets in Kinshasa, where Sweet C is from and still lives, have been full of scenes like the one above. 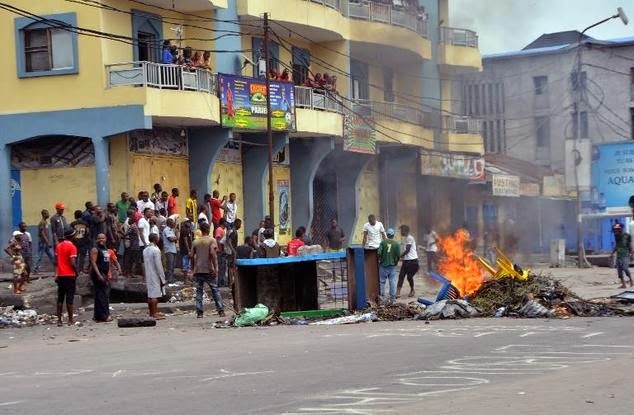 Protests, looting, and demonstrations have taken over the streets, leaving citizens who wish to stay out of the conflicts stuck at home with boarded windows and doors. On orders from the government, cell phone and internet services have been blocked. The conflicts appear to be a result of a vote on Saturday to complete a national census, which protesters say is a ploy to allow the current president to remain in office longer than the constitution currently dictates. The House of Representatives approved the census, while the Senate is currently debating it. You may remember that I mentioned (here and here) a special session of Parliament that was originally said to include a vote on the Family Code, which we hoped would help spur the Exit Letter Suspension forward to resolution. That Family Code vote appears to have been a pipe dream, and we are now hoping they can vote on it in March. However, this conflict adds stress (and panic) to a lot of adoptive parents who have children so close to the violence, and whose lives appear to be dictated by the government's decisions. Clearly, the government is dealing with many issues, and we are concerned that the adoption issue may continue to be swept under the rug so that the current president can continue fighting to run for a third (and currently unconstitutional) term. Couple all of the above with the fact that a delegation from Chairman Ed Royce's office (in Southern California...AMAZING ADVOCATE for our children) has been in DRC to meet with adoptive parents who are currently living there with their children (because they can't bring them home) and to meet with DRC officials. We are not even sure if those important advocacy meetings took place, which is almost soul-crushing when you are hoping to hear of some inkling of good news. However, we we do know the delegation is safe, and for that we are thankful. Please pray. We need a MIGHTY SAVIOR to intervene.